If LH had some 787s they could be serving a lot more secondary cities in North America and Asia profitably. 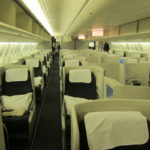 But their smallest long haul aircraft are A330/340-300, which have a lot of seats to fill. Not surprised. It had pitiful load factors. Same for Air China. Imagine what if both have lots of 787s. Always felt they chose the wrong planes (A330 / A340) to fly into San Jose in the first place. San Jose is the poster child for 787 use case. time and again, it’s been shown that the mirage of SJC being a jackpot just due to “proximity of silicon valley” has been proven to be fool’s gold. And people are missing the biggest picture of the last 6 years – the northward migration of Silicon Valley. Now startups are routinely out of random small towns along the peninsular if not in SF downtown outright. The weighted center of mass is no longer the good ole days of Intel at Santa Clara or Sun Microsystems at the borderline between Palo Alto and Mountain View, but slightly north of Menlo Park these days. It’s not anything about SFO’s choice of carriers or SJC’s limited infrastructure – it’ts simply “Silicon Valley” moved closer to SFO. Agreed, and the only thing that will push more international flights to SJC is if there is no gate space/landing slots at SFO. When it reaches capacity only then will you see things move to SJC. A pitty, there was quite good award availability on this route, and it was sometimes a cheaper alternative to SFO for paid tickets. There is some truth to that but the reality is SJ’s population is greater than SF’s and keeps sprawling south. And while start-ups may be booming in SF, more established companies keep growing in SJ, Santa Clara, Cupertino, etc. This doesn’t even begin to to mention the fact SJC is a way easier airport to navigate as a passenger (if you have precheck I am frequenlty from curb to gate in less than 5 mins) and the weather situation helps a ton too for aiding with on-time rates. I honestly think they could have made this work if they had a more premium heavy plane — like the BA one they are competing with. J is frequently full on this route when I have checked. The flipside to that is, I do think it is hard to sell this for leisure pax starting in Europe. SJ is not SF when it comes to tourism and you have to have a solid knowledge of the region to even know to look out for this airport. These are not two airports on different sides of the main city, these are two airports for two different towns. All things the same, there is no reason to fly to SJC if you final destination is downtown SF. @AdamH, we all know the city proper population numbers have little to do with air service. Who cares if more people live in SJ proper? More people also live in San Antonio & Jacksonville than SF. counting city population is rather meaningless here. The Census Bureau lists SFO-OAK and SJC as 2 separate MSAs which is just about the most ridiculous thing possible. The sprawl is also heading east, in which neither SFO nor SJC has any distinct upper hand over the other. But you seem to correlate population growth linearly to long-haul service. That argument is a lot stronger for near-by services to LA Basin, weekend fun at vegas, or quick getaway to the islands. But since we’re talking specifically about long-haul services, where business support has disproportionate effects on a route’s chances, the sprawl occurring at the edge is a lot less consequential here. i mean do you really hear people hyping Stockton SCK or San Bernadino SBD ? We’ve heard similar rose-colored predictions about Islip ISP as alternative for NYC, Providence PVD for Boston, Hamilton YHM for Toronto, or even Rockford RFD for Chicago. but for SFO, the only diff seems to be the NIMBY are doing an excellent job at preventing even moving runway 28R further out the bay to bring the separation up to Cat III parallel landing requirements. And that’s just about SJC’s chances (and if u think about it, SJC is even more boxed in than SFO is). Lufthansa could have gotten much more visibility if they included San Jose as a neighboring airport for searches to San Francisco. American Airlines does so as it lists “alternate area airport(s)” by default in the search results. 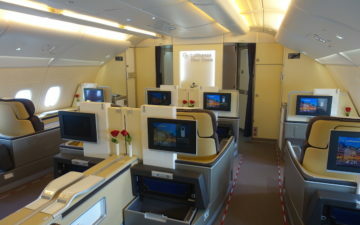 I hope Lufthansa will return to San Jose, maybe with higher fuel efficient planes and more premium seats. Goodbye to the arrival plus 15 minutes total for immigration and baggage claim which is at least 45 minutes at SFO with the A380 and trying to find bags between carousel 5 and 6. That is really sad. There are many people living in the southbay and I agree SJC is a much easier airport to navigate. I noticed low load factors on that flight as well and I think it has to do with lack of advertising. Most people simply didn’t know and automatically search for a flight to SFO. Even I, knowing about that flight had sometimes forgotten about this routing and then realized, oh wait, I should really fly into SJC. By default you search for SFO. This has nothing to do with the tech centers supposedly moving north, that’s completely BS. The tech center remain for the most part around Mountain View/Sunnyvale/Palo Alto. I agree with a lot of the sentiments here. SJC is perhaps good for a quick flight to LAX or SAN so as to avoid SFO parking, long rental return, etc. But for International flights SFO is almost as close when thinking Palo Alto and environs. They are just not that far apart. 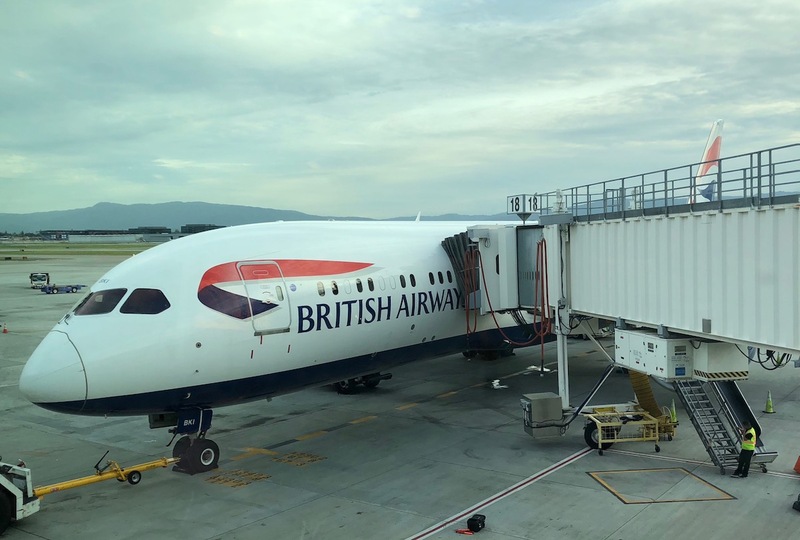 And for International flights I will always choose SFO for better lounges (the BA lounge in SJC is pitiful), duty fee, amenities and, most important, numerous alternate options in case of flight delays or cancellations. An example is that If BA has a significant delay in SJC or an outright cancellation you are going to get shuffled up to SFO and probably not make it out until the next night. I know there has been a lot of talk about Ontario in SoCal recently and I actually see that as a much more viable target for secondary International flights (especially to Asia) over LAX. It can take two hours to get to LAX from the inland empire during high traffic times and it serves a massive population center. As well it is great for International travelers to access Palm Springs and the high desert cities. One of the issues with ex-SJC flights is a matter of education. Many people do not know they exist including employees at the big tech companies based near there. Searching SFO on most search engines will not also include SJC (or OAK for that matter).